See Drawing 3a for tenon size. 1/t" groove Va" deep panels (F) to size. Dry-clamp the four frame-and-panel assemblies to check the fit. Then, glue and clamp the assemblies, checking for square. 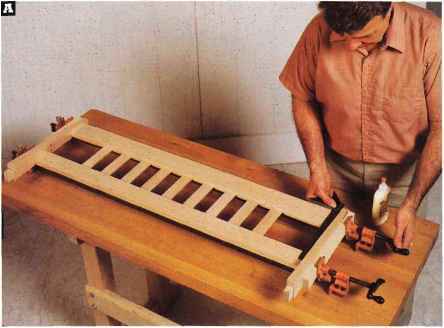 7 With the outside edges and top and bottom ends flush, glue and clamp the four frame-and-panel assemblies together in the configuration shown on Drawing 1. ICut the cleats (G, H) to size. Drill countersunk screw holes through two adjoining surfaces of each cleat. 2 Next, with the bottom edges of the cleats flush with the bottom edges of the bottom rails (A, C), screw the cleats in place. 3 Measure the opening, and cut the bottom panel (I) to size from W plywood. Working from the bottom side of the base, glue and screw the bottom panel in place. -Sand a slight bevel on this edge to fit angle on part (3). ICut the seat frame parts (J, K) to size from 1 '/i6"-thick stock. 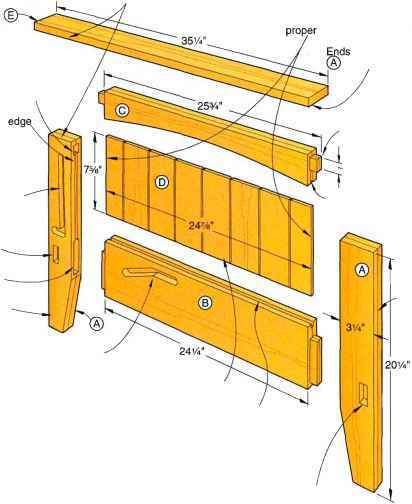 2 Using Drawing 1a on page 5, drill a pair of dowel holes at each mating joint joining the frame parts (J, K). 3 Glue, dowel, and clamp the seat back frame member (K) between the side pieces (J). (To help keep the assembly square when clamping, we cut a temporary spacer the same length as part K. Then, we clamped the spacer between the front ends of parts J when gluing K in place between the back ends.) Check for square and that the pieces lie flat. 4 Edge-join stock to form the I5V2"-wide seat (L). (We edge-joined stock to form a seat blank that measured 41" long.) 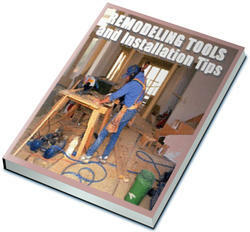 For ease in aligning the strips, consider dowel or biscuit joints. Later, trim the seat to finished length. 5 Rout a '/V'-deep V-groove in the top of the seat panel (L) 3" from the front edge of the seat and centered along the joint line. 6 Cut the cleats (M, N) to size. Drill the countersunk mounting holes, and screw the cleats to the inside of the hall seat's base assembly. ICut the armrest supports (O) to size. Then, referring to Drawing 1b on page 5, cut a '/V'-long tenon on the top end and a 1 '/¡¿"-long tenon on the bottom end of each armrest support. 2 Using Drawing 4, above, for reference, cut the armrests (P) to size. Cut a notch in the back inside corner of each. Cut a Vi radius on each of the three remaining corners. ICut the seat back stile blanks (Q) to the size shown in the Materials List. Fit your tablesaw with a dado blade, and form a 1 '/V'-long tenon at the bottom end of each stile (Q) to the dimensions shown on Drawing 5a. Immediately after clamping, check the seat-back assembly for square, and adjust the clamps as necessary.